A couple of weeks ago, I went to see a special screening of Local Hero. It’s an excellent film, and if you have the opportunity, you should see it. The director Bill Forsyth was brought in at the end to hold a question-and-answer session with the audience. He mentioned at the beginning that he hadn’t seen the film in years, and an audience member asked why this was. He answered that he wasn’t ashamed of his work, simply that he wasn’t interested in looking back, and questioned whether – for example – a writer would be interested in rereading their old stories. Contrary to the director’s opinion, my answer is a definite yes. I openly admit that being a writer wasn’t a childhood dream, and I therefore don’t have notepad upon notepad of embarrassing teenage musings. Rather, I wrote my first fiction in late 2010, just before I turned 27, and looking back enables me to keep a weather eye on how I’ve improved. Even if I come across an old piece that I find jarring, I know I only need to rewrite it, or in extreme cases, deconstruct it, to bring it up to my current standards. A prime example of such a jarring piece is one of the first poems I wrote, called The Cooler, a short verse about a character’s self-imprisonment. Looking at it now, it needs to be longer to fully convey the situation, as it’s currently unclear, and the clumsy language needs to be trimmed, eg, “It stays cold all night like a fridge.” Now I’ve looked back at it, I can think about these issues and improve the work. In my next entry, I intend to cover the issue of rewriting in a more in-depth fashion. I mentioned I’ve been writing fiction for less than four years, but I was a blogger long before that, discussing the issues on my mind at that moment, much as I do here. That writing is a little embarrassing, but it’s only by looking back that I can see how much I’ve moved on. Here’s a typical entry from almost exactly ten years ago. There are many writers who started later in life, and I found out recently that John Grisham is one of them. He didn’t write his first novel until he was in his 30s, and didn’t give up his work as a lawyer until his second was published. Last year, I joined a Life Writing class at the University of Dundee. One week, the tutor asked us to make mood boards to represent the themes of our writing. I didn’t look forward to this at all. As I’ve mentioned in previous entries, I’m not naturally gifted in visual expression. But having consulted an artist for advice, I acquired materials from a nearby recycling plant, and pieces gradually fell into place. 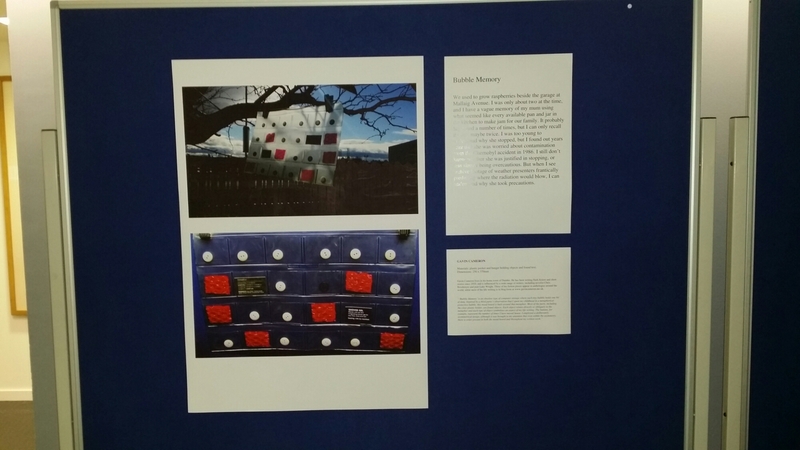 This task led to a short exhibition at the University where most of the class displayed their boards, with explanatory text and a personal story alongside each one. My mood board came to be titled Bubble Memory, constructed of a 35mm slide holder with buttons and other found materials in each pocket. The photograph shows how it was displayed in the exhibition, which closed on Friday of last week, although we are in talks to extend it. Despite my initial dread, I was pleased with the all-round results. This is not the first time I’ve experimented with alternative formats. Text-based artist Gerry O’Brien was also a member of the Life Writing class, and submitted a piece of homework on a thumb drive. It contained a PowerPoint presentation that told the story of meeting a man from Honduras in text, interspersed with photographs. The presentation runs automatically at a slow savoury pace, allowing the viewer to absorb every detail. Inspired by this, another class member created a similar project, speaking about the dolls she makes and collects. And inspired by both their achievements, I converted an existing poem of mine into the format, but with no pictures and no audio. The text is displayed to the reader at approximately the speed I would speak it, but there is freedom on their part to imagine the emphasis and inflections. I started experimenting with formats a couple of years ago when I took part in the Sketchbook Project at Brooklyn Art Library. I broke down one of my short stories into fragments of one or two sentences, then converted each fragment to a QR code. This is a square barcode that can be read by many mobile devices. When it’s scanned, the device shows the fragment of text. I then glued each of these codes into the sketchbook in the right order to tell the story, and sent it back to the Library. It was then scanned and placed online, while the original sketchbook was taken on a tour around America. This is the finished sketchbook. The following year, I submitted an apology for the artwork in that first book. I don’t think I will ever move completely away from text on paper, but the occasional piece in another format or another medium can engage the reader in a different way. I’ll leave you with the story of the world’s first hypertext novels, a form that would be challenging to reproduce on paper. Taking Care of Business Cards. At the end of June, I ordered a set of 500 business cards. I realised I needed a quick way of letting people know how they could reach me if the situation arose. I could write down my details but it’s less memorable, and often less readable, than a proper card. It contains my phone number, e-mail address, Web address, and Twitter handle; the former is censored in the photograph as it’s a personal number. I chose not to include a, “job title,” such as writer, poet, blogger, &c, as I didn’t want to make people feel as though they could only contact me in connection with these skills. Instead, the general sense of what I do is conveyed by the books in the background. I bought the cards from Vistaprint, who threw in a metal holder free of charge, although there are more expensive services such as Moo.com. Just a couple of weeks later, I did indeed need one to tell a fellow blogger about this page. I currently earn very little money from writing, but I felt like a professional as I handed it over. Over the last three weeks, I’ve received two similar e-mails from two completely different publishers. They were both rejections, but each invited me to submit another piece for their respective next issues. The first of these was a bulk message, but sent only to selected writers. This group invite experimental and unclassifiable work, so while I’m particularly pleased they liked what they saw, I’m unsure if I’ll have anything else quite so nonconformist. The other place sent a personal thanks, and as it’s more mainstream, it shouldn’t be too difficult to resubmit. I’m reminded of when I submitted one of my novels to a publisher. They liked the first three chapters enough to ask for the rest of it. They ultimately turned me down as they felt the plot didn’t place the character in enough peril. But they did it in such a constructive manner that I felt I could raise my game and resubmit it, even when I thought it couldn’t be improved upon. Sometimes it’s just a matter of waiting before a second chance comes along, although James Jones didn’t live to see his reprieve. In 1951, he fought to keep the swearing and gay content in his novel From Here to Eternity, but his publishers wouldn’t allow it. By 2011, times and attitudes had changed, and the uncensored book was finally made available.